Mushrooms have these beneficial properties: anti-inflammatory effects, enhanced immune cell activity, prevention of DNA damage, slowed cancer cell growth, and angiogenesis inhibition. 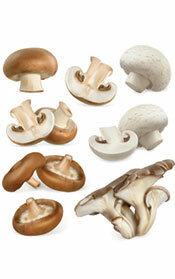 More on mushrooms and the other 9 on site. Like all.Thanks for the good info Fiona!! They are my staples, except for garlic which i can't stand but i take a good garlic supplement!!! With the exception of pomegranate, I eat one or all of these daily. Try to eat most of these. I don't eat all of these every day, but overall get a good variety. I just polished off a big pot of home-made mushroom soup - yum! I love mushroom steaks covered in olive oil and garlic. Love veggies and drink a shot of olive oil a day usually to wash the garlic down. Good eating in Red Sox Nation.